As I was driving home, I was able to reflect on the weekend and I felt so incredibly blessed and thankful. Tribute has become our favorite competition of the year, not just because it is so well run or because of the wonderful people, but mostly because you and your staff treat everyone equally and your values align with ours. Thank you for such a great weekend in Tulsa and for all you do to make each student and teacher feel valued and special. Thank you for such an awesome weekend! Just wanted to let you know how many complements came my way about your competition! 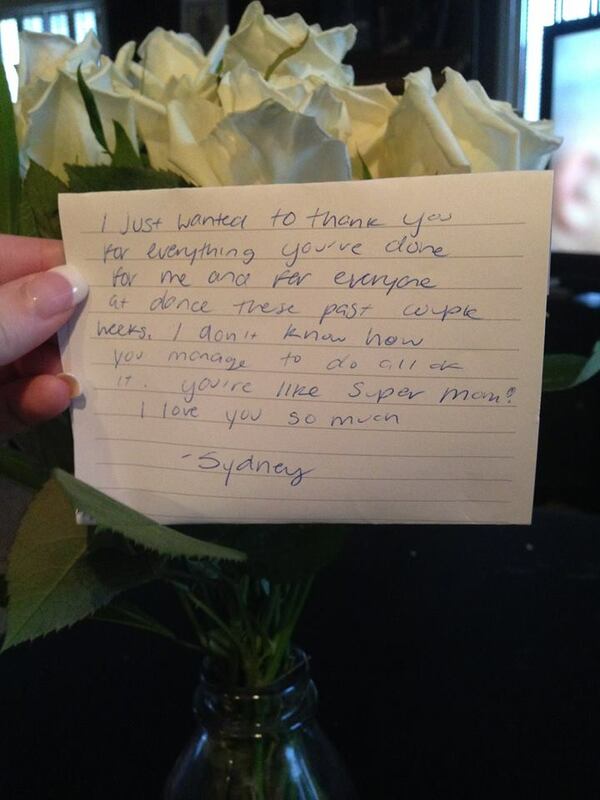 It doesn’t go unnoticed your kindness towards dancers, teachers and directors. You seriously run an amazing organization with top talent and competition that feels like home. Just wanted to thank you for creating such a warm competition for all of us! Will see you next year and good luck with the rest of your season! Thank you for an unforgettable Tribute weekend in Kansas City. From the Tribute to my Parents Essay, to the Special Angels Category and to numerous awards it is a weekend HJ Dance will remember. We look forward to joining you again in 2019. I am not a dance mom, just a dance Aunt who comes to help when needed and cheer on the dancers. I just want to take the time to let you know how much I love you, your family and your competition. I love that yours is truly a family affair. I didn’t get to see your kids this year because I missed all of the awards sessions, but I am glad they are doing well. Out of all of the competition’s my niece and her studio go to, I love yours the most. You truly care about each and every person attending, whether it be a dancer, parent, teacher or spectator and you care about making it a financially affordable event for everyone to attend. Putting your programs online and allowing for pictures and video is greatly appreciated. I also love the fact that you are truly visible the entire time. I was there from Friday through 5:00 on Sunday evening and could see you all over the place. Keep up the good work and know that what you are doing is truly special and appreciated. Our dancers, staff and families truly had one of the best competition weekends we’ve had in a very long time! We all left Tribute with very full hearts and much gratitude for having the opportunity to be a part of the Tribute weekend. I also sat up (quite late ;)) last night and listened to some of the best critiques I have ever listened to. Not only did the judges give constructive criticism but they also balanced it with wonderful positive feedback. For me, the best compliments I can receive as a director, teacher and choreographer come from my peers who do what I do. They inspired me to want to keep doing this for a very long time. I feel so blessed to do what I do! It was so great to see you and I’m glad we were able to support your competition with groups this time and not just a few solos! As I said, we are putting Tribute on the schedule for the minis and juniors as well as the teens and seniors for next season. Looking forward to next March! Thank you for a fantastic event!! I appreciate your values that are reflected in the way the competition is run, and at every single interaction with your staff. Kudos to you for creating a professional and positive environment! My daughter just finished up competing here in Orlando. This being our first time participating at Tribute, I just wanted to share what an amazing time we had and how impressed I am with the program you have put together. Our studio has participated in quite a few different competitions, but Tribute has honestly been one of my favorites!. The consistency of the talent participating in a single competition was amazing to say the least! I absolutely love the way you have carried your theme of “Tribute” through to the kids by encouraging them to give tribute to their parents and teachers. Such an awesome way to round out all that goes into competition weekend!! Thank you for providing such a quality platform for these kids and teachers to showcase what they love! What a Tribute you have given your father!! I just wanted to send a quick thank you to you and your staff for an amazing competition a few weeks ago in Claremore, Ok. We were amazed at the professionalism and overall inspirational feel at your competition. I posted this in the Dance Teacher Network Facebook group and also the Dance Teacher Vendor Facebook group, so I am sure several teachers will be checking you out if they haven’t already! Thank you again for all of your amazing help. My name is Nadine Zaun and I’m a parent of a dancer that attends P & D dance company in Kansas City.I’ve been meaning to send you a note about how impressed I was with your dance showcase.I thought you were an excellent host, from the tone and timing of your voice to expressing and sharing your passion for family within the dance community but also within our own families at home. I loved that you welcomed the special dancers on stage and spoke about your Dad. I really felt you loved what you do and it was very engaging for the audience.I loved that your children were so professional and involved, I loved their attire and they were amazing on stage, they even positioned their bodies just right whilst handing out awards. I was smiling because they were so good…. I felt they could handle the Oscar presentations easily!Your family made the weekend feel special to everyone….nothing was rushed or delayed. I really liked the encouraging words you spoke to the parents and dancers. Your whole approach is wonderful!As a family you definitely portray great family values! I think you might be doing more than just running a dance competition you are teaching some great life lessons. Tribute is a competition that I am honored to have attended. My studio and I absolutely love everything that the competition stands for and represents in our dance industry. Darin’s competition is honest, genuine, and the most “family-oriented” competition I have ever been to. Darin cares about each and every client and makes every single dancer, family member and studio owner feel like a million bucks. From the schedule to the facility, he always holds a high quality event. I am so thankful to be a part of the Tribute journey and love being a part of his competition family! Thank you so much Darin for a fantastic weekend! You and your family are a class act and we can’t wait until next year. My parents had so many wonderful things to say about the weekend. It is so rewarding when you leave a competition and everyone is inspired and excited. Thanks again. Thank you for having such a Fantastic competition! Our students loved the weekend! Not only fantastic awards, but great location and friendly competition. Thank you Darin for all you do for the kids, parents and directors! It’s obvious you love what you do! We’ll see you next year! Thanks for a great weekend. I’ve received such positive feedback from our parents about Tribute. Your entire staff is top notch and very kind and inviting individuals. Have a great season, see you next year! Just wanted to send you a big THANK YOU!! Once again we had an amazing weekend In Des Moines with Tribute, a first class operation all the way! The entire staff is always friendly and makes you feel like you matter. There is a saying that “Being Big Never Saved the Dinosaur”…… and that is when you lose the personal touch that dancers and families love. So happy that you strive to make your company the best, but not the biggest!! I just wanted to take a moment to thank you again for such a great event in St Louis. While we are a new studio (going into our 5th year now) and not the biggest we never felt disregarded at your event. We are still one of those studios that do not have girls in the studio 5 nights a week and we still like to allow for a good dance/family/home/school balance. But my main reason for writing you is that we recently had a parent survey time and by far the way you run your event, the guidelines for times, the pricing for merchandise, etc was a HIGH NOTE from parents. No missing school on Thursdays and Fridays is a big issue that we are dealing with. We have girls who’s parents are questioning being able to return because of having to miss so much school (and work for parents) during competition season. We have many parents that struggle to make dance available for their children so the great competition fees, the complimentary print your own program and merchandise that has affordable pricing is something that they realize is a difference between one and the others. For these things, I applaud you and your team. Keep up the good work and myself and our Studio E Parent’s thank you from the bottoms of our hearts. You often hear people say when it comes to careers, “Did he or she answer their calling?” Well after seeing the passion and care that you have for the dance community, you have definitely answered your calling. Every year we start off our dance competition season by attending the Tribute National Dance Competition at the Hopkins High school in Hopkins, MN. We always look forward to this competition because no matter how our daughters teams place or how the studio does as a whole you and your staff make each dancer feel special as they come on and off the stage. As parents in the audience we often think about the price of dance and the time commitment, yet you remind us of all the blessings we have and that the ability to dance at the competition level is a gift. I am sure your father is very proud for all that you do to honor his name by all of your contributions to the dance community. My family and I are grateful to be a part of your dance community every year. Thank you for putting family first. Best of luck to you and the Tribute National Dance Competition Company. Wonderful does not begin to describe the weekend we spent at Tribute National Talent Competition …. but I wanted to try and say thank you anyway…. Thank you for making our special angel Layne feel welcome on the stage.. and for the beautiful medal you made for him. Thank you for keeping family (both dance and home family) and God first… and for letting that shine in everything you do. This is what matters in our studio, and I love that about your competition. Our parents were beyond impressed with you, your beautiful little ones, and the efficiency and smoothness of the competition. Fantastic and Fair judging, and a positive demeanor all weekend long. I know how much you miss your dad… and you show it in everything you do with Tribute. My girls are missing their granddad… and Bailey Langkan and Savannah Enoch show it through their dancing. Thank you for the opportunity to let my girls, our company, and ALL of the AMAZING dancers from so many wonderful studios this weekend shine their light on your stage. You should be truly proud of what you have created. Keep on doing what you are doing…. This weekend’s competition was fantastic! Your “family” ran a top notch event and it was refreshing to participate in a competition that focused on, not only the dancers, but values, integrity, and most importantly family. I was blown away by the Tribute to my Parents essay! Compliments to you and your focus on the kids and their passions and not on all of hype that other competitions seem to thrive on. I realize that you are only in your third season but I see great things in the future for your company and its mission. Any parent that participates and has a child or children that compete in one of your competitions will be reminded of what matters and is most important in a dancer’s life – acknowledgement of gratitude, respect and admiration. We all do it for the children and their passions. Congratulations to you, your family, and your team in focusing on what is more important. BTW – really cool how your daughter gave you a hug every time before she handed out the awards. Much appreciation for an outstanding event and may God continue to be with you and your family. What an amazing weekend at Tribute in Chicago. This is our first Tribute experience and let me tell you , we have been to several other competition programs and YOU all by far are the most professional, family run program we have ever been too! From the minute we walked in until we left it was nothing but smiles, enthusiasm and positive energy everywhere!!!! It was so nice to talk to Darin and his wife personally! Wow, I was amazed and wish every talent competition was run and had morals and values like you all possessed over this weekend! Bless you and your staff and I look forward to hearing more about your son and CANNOT wait to see you all next year! I am feeling so very blessed! What a wonderful weekend in Chicago with our amazing dance families!!! Our travels have taken us many places but I absolutely LOVE going to Tribute National Talent Competition. Darin and his staff are so very family oriented and everyone feels connected. Thank you from the bottom of our hearts for the support that you show our girls! The hugs and the kind words were amazing! Your kindness and love will never be forgotten! I just wanted to say how much I appreciate your attention to detail. The sound is incredible and the venue you are using for Chicago is excellent. Tribute is by far the most professional dance competition company I’ve ever seen. Great job! Just wanted to say how much we absolutely loved being at Tribute National Talent Competition you make this experience feel more welcoming than I have ever experienced! We have been with Brook Langkan and Storm Dance Alliance for 5 years and this truly was the best competition we have ever been to… hands down. Loved seeing your daughter hug you every time. Kudos to you as well for making a special place for kids with special needs it holds a special place in our hearts since some of our dancers have brothers with either autism or down syndrome. As a mom with a son with autism this means so much! Wishing you a wonderful and blessed rest of the season! I’ve been trying to find the words to write what an amazing weekend our family had at Tribute and Dan Marguerite Poch summed it up perfectly! This competition is like no other…above the beauty of the dancing is the display of love and support that everyone felt! It is a rare feeling but a beautiful one! The personal touches you put in to Tribute make it so much more special! We loved watching the help and support of your beautiful family, the touching tribute letter… And as a mother of a child with special needs to include our special children in your program- there just are no words! Keep doing what you are doing! By far my favorite competition! Hi Darin! Just wanted to say thank you from Summers Academy – we had a great time at Tribute last weekend! Our dancers, parents, and coaches all enjoyed their experience, and we will definitely be returning next year! My daughter hasn’t asked to buy any competition merchandise at all this year, but Tribute was the exception. She has been proudly wearing her Tribute shirt and sweats (I hope to peel them off of her at some point to wash them…..). I appreciate the fact that your merchandise is very reasonably priced. Our studio owner, Vicki, really wishes she could have come and plans to make sure she can be there next year. If I could talk our parents into it, we would travel the country to attend multiple Tribute events (our coaches agree!). We can only hope to find some competitions next year that we enjoy as much as Tribute. You are doing an amazing job, and I am so happy that Tribute was our last event of the year. It ended on such a positive note for everyone involved! I look forward to seeing you again next year, and I will be keeping up with you on Facebook – I will be praying for Jonah and hope that you will continue with updates on him. Just wanted to thank you for a wonderful weekend. You are truly a class act. Every one of your staff was supportive, kind and generous. The kids loved the guys back stage such a plus. Critiques are very helpful and your judges where attentive to the dancers. The kids even said they could hear them correcting them as they danced and it made them work harder. Your family is beautiful and I’m sure that Karen and I would be great friends if we lived close enough. Love your kids, it’s great to see that you are showing them what you do and how hard it is. They will appreciate you more and learn some great lessons. Shannon and I appreciate all that you do for the dancers and teachers. WHAT AN AWESOME WEEKEND! Thank you for your hard work and for sharing your family with us. Tribute is by far the most touching and sentimental competition out there. I love the Tribute letters.. Made me cry and such a nice touch. 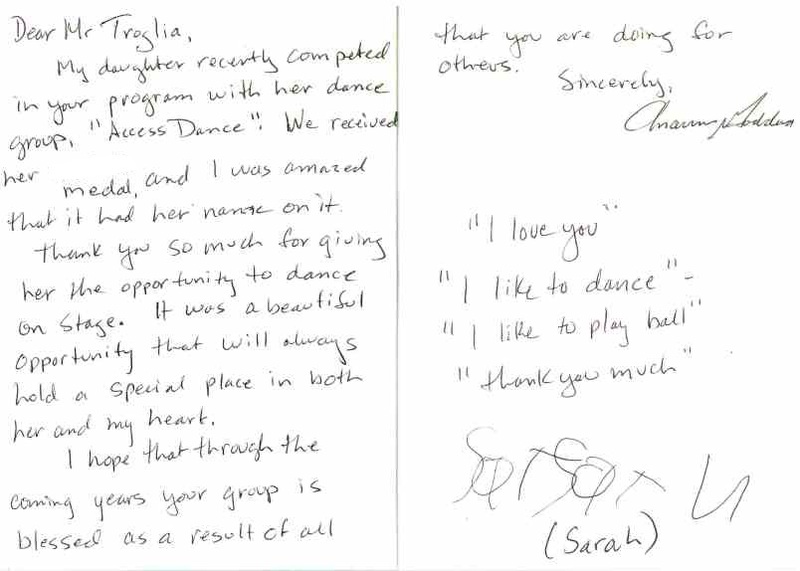 You are doing great work and touching lives and changing dancers’ lives. So proud to be a part of it. Your dad would be so proud of your Tribute to him. It was a pleasure to meet you in person and to win the costume award was icing on the cake. My daughter and I worked on it together and it turned out great. Was so nice to be recognized and have my daughter be proud of me. Thank you, thank you, thank you! You have a beautiful family! Thank you for a fun time at your competition last weekend. It is one of the best run competitions that I believe we have been to. Thank you very much!! I also want you to know how lovely I think it is that you invite your children onstage with you. Fabulous!! The dance studio that I teach at just attended your Detroit competition for the second year in a row, and we love it. It is always so organized, and the staff members are always so friendly and helpful. I also love how you make the entire experience so “family oriented”. You attend every event, your children help pass out the awards, you have the “Tribute to my Parents Award”, and you have the “special angels” category. Thanks again for always providing a great experience. Darin, this was my first attendance at a Tribute Talent Competition this past weekend in Kansas City at the Music Hall. My 9 year old granddaughter performed with Priscilla & Dana’s School of Dance. I wanted to take a moment to relay my utmost appreciation for the creative efforts taken by you and your family to make your competition one that the young dancers will always remember. The effect of a family atmosphere is very impressive and creates a very fun atmosphere for all involved. Your daughter is so precious and made the awards ceremony even more special. Both of your children were so mannered and helpful. 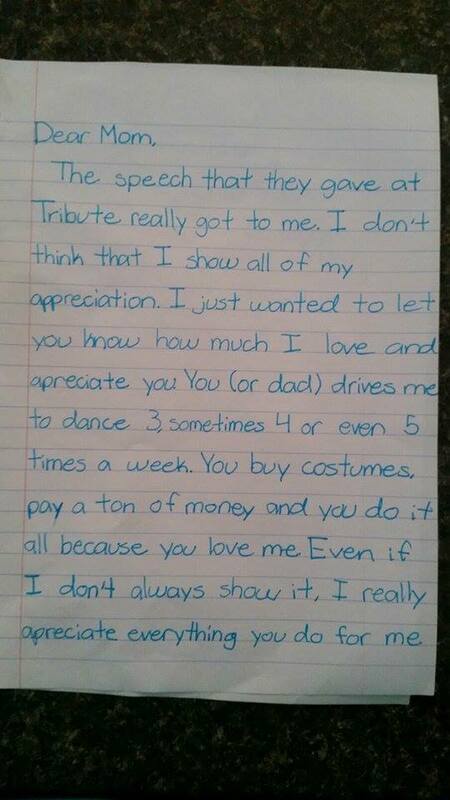 You should be a very proud Dad. Your stage presence and love for those dancers can be felt. I was impressed with your inclusion to your competitions for an essay to be written by any dancer with subject of ‘Tribute to my Parents’. Also, the Special Angels category creates moments that are so special that it brought tears to my eyes. God bless you for including these children in moments they will always cherish. Best wishes for your continued success with your competitions and a personal thank you to your family for believing in creating those personal moments for all involved. My name is Blair Browning and my daughter participated in the Tribute competition this last weekend in Denver as part of Miller’s Dance Studio. I wanted to write a quick email to let you know how much her mother and I appreciate your overall business model. Having a company that focuses on family and truly appreciates the business they are getting is unfortunately not the norm in today’s world. The Tribute to My Parents essay was very touching, and the fact that you take the time to award such an essay is great. We as a family felt like Tribute appreciated our business and that is something we often don’t feel from other competition companies. I know that other families feel the same way we do, and we all will highly recommend Tribute for future competitions. Keep doing what you are doing, as the world needs more people and companies like yours. What a stellar job you do Darin. The compliments keep flowing in from families here, and we wish you and your family a restful week. Thank you for such an amazing weekend! By far the best competition I have been to..it was so fun and just a great atmosphere! All of us at Millers Dance Studio enjoyed your Denver show. Thank you for all the care your staff and yourself showed during the weekend. Such a fun weekend of great dancing and positive energy! Darin, you are an inspiration; we are so thankful for you and your spirit! And thank you to all the awesome studios with your amazing talent for making it a super fun event! It was an awesome weekend with such a positive atmosphere! PHD will be coming back!!! Just wanted to send a quick note to let you know how pleased we were with the Tribute competition in Detroit. I have had so many positive comments and emails from parents about how “the atmosphere is just so positive” and how it was well run and enjoyable. As a teacher who has taken dancers to many competitions, it was VERY refreshing to come to a competition where very few dances got the highest award. It really makes it special for those who do because the dancers can see that it is hard to attain. The dancers & parents were very proud of getting so many overall awards (thank you for how you have that set up). 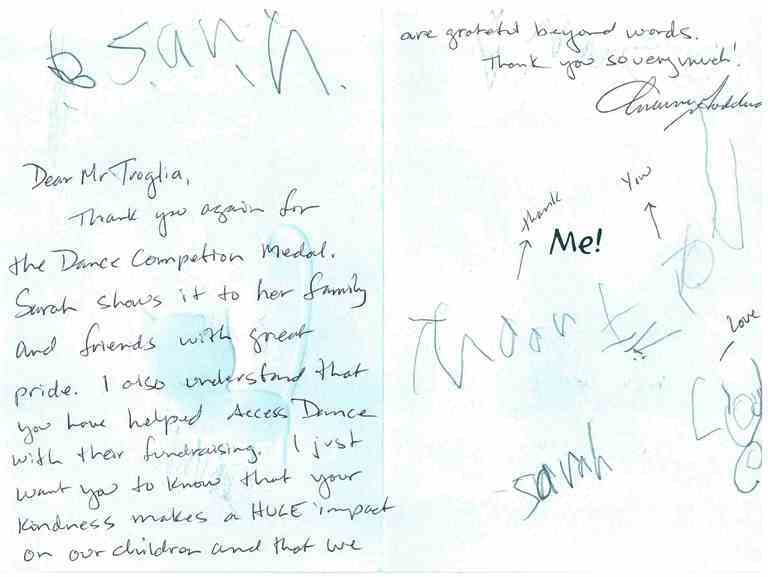 I cannot say enough about how much the special angel category meant to those dancers and even more to their families! Thank you so much for giving them the opportunity. Overall, our team has decided that Tribute is our new favorite competition! We look forward to seeing you in Detroit for years to come. Congratulations Darin on Tribute National Talent Competition. In just two short seasons you have made your competition truly one of a kind and our studios favorite. The professional and courteous staff, on time schedule, 3 day only event, Free Program Books and the Tribute to the Parents Essay makes for a very special weekend. Your personal connection with the studios makes everyone feel special and your genuine kind heartedness makes Tribute feel like a Family Event not just a competition. So happy for all of your success and we are looking forward to many years competing at Tribute. We at Top Hat Talent feel so incredibly lucky to have the opportunity to compete at Tribute Dance Competition each season. Our dancers and parents look forward to the timely schedule, professionalism, family feeling atmosphere and positive experience it gives our kids every year. Congratulations Darin for fulfilling your dream and bringing it to fruition for these children…your passion, personality, humility and talent are a vital part of what makes and keeps Tribute a success on so many levels. We appreciate you! 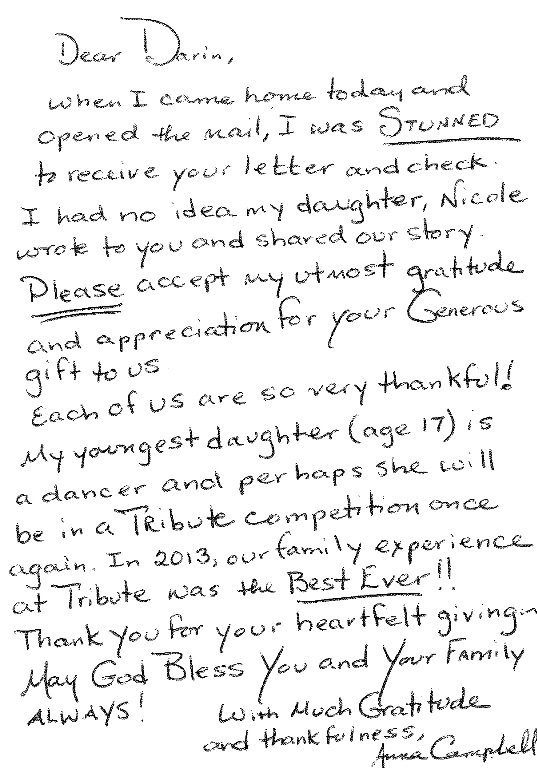 Our families at Starstruck Dance Academy are so honored to be a part of the “Tribute Family”. We love everything that this competition stands for. This competition is full of fun, excitement and is the weekend we look forward to every year. Darin is a wonderful man who is a living example of Faith, Compassion and Commitment for all those who join him on this “Tribute Journey”. Darin and his staff are great role models for our children to see what healthy competition should be. I have had the privilege of knowing Darin Troglia for many years. He used a time of despair to grab hold of his faith with an even tighter grasp and not only did he grow stronger as a person, but as a leader and example to everyone around him. His TRIBUTE to his late father is enabling children and adults from all walks of life to be thankful, to be loving and above all – to live. He is a genius at his craft; let’s face it, Tribute is one of the most professional & classy talent competitions to exist. However, it goes way beyond the lights, stage, music and judges. By attending Tribute, we witness faith and family as the foundation of a strong business. Thanks to Darin my family of dancers & their parents leave the weekend feeling renewed and inspired and that is a privilege like no other. Finally a competition that put’s family first. 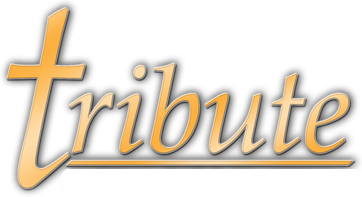 From scheduling to the amazing staff, Tribute pulls together all studios in attendance as ONE. We are all in it for the love of dance and the kids. Darin and the Tribute staff are second to none. Darin’s love of family is evident throughout Tribute events. From scholarships to charitable donations, Tribute gives back to the dancers to enrich their lives inside and outside of the classroom. At awards, Darin takes the time to celebrate the relationship between great kids and parents. The Special Angels category is one of our favorites, and is a great outlet for our special needs dancers. Tribute is a family-centered FUN competition. When you combine those attributes with a competition that is well-organized, runs on-time and has great talent, it’s a winning combination! We love Tribute! I have known Darin for over 20 years and he has always conducted himself with dignity and kindness and the competitions he’s involved in with efficiency and enthusiasm. TRIBUTE is all of that and more; professional, on time events, with a courteous, calm, and encouraging staff made a delightful competition for our dancers! The professionalism of TRIBUTE has made our studio excited to return to your competition. Thank you for continuing your outstanding traditions in this newest endeavor. You have encouraged our dancers and their families to support our competition team with more enthusiasm after attending your event…Thank you my friend. Just quickly want to say Thank You again for a great weekend at Tribute!! I appreciate the standards that you’ve set for this industry that can sometimes be overwhelming and self-loathing. It’s great to go to a competition and feel humbled with life in general. You have a lot of integrity and I’m grateful there is someone like YOU in the “dance world! !” I would recommend Tribute to everyone. Take care and have a great break!! I have known Darin for many years and when I heard he was starting Tribute it was a given that our studio would attend. Not only is it a fair competition but it is one that the students, parents and faculty love to go to. Everyone feels like a winner and leaves with a positive experience. The Special Angels category is one that really hits home for us as we have a group of down syndrome dancers that get their chance to show off what they can do and love. Looking forward to the next competition! I wanted to thank you and your staff for the compassionate outreach that was given to my daughter this weekend in Davenport. When she injured her hip the last thing she wanted to consider was that she wouldn’t be able to dance. She lives for dance. After warm up for her duo it was clear with the pain that she wouldn’t be able to dance. She was so upset for herself and more so her partner. As a parent, you entrust your girls to those backstage when you aren’t there. Your staff reassured them that you would offer a refund so the girls could re-center and cheer their Xtreme team on. Tessa Medinger was very impressed as well and she has been to many competitions. Not many organizations are as thoughtful these days. Bailey was able to leave Friday night for home to refocus on icing and resting to heal instead of worrying about missing her duo and her three other team numbers Sunday. Thank you again…Tribute is one of a kind. Thanks again, I really appreciate your staff. I just wanted to drop you a quick note and tell you what a wonderful weekend it was! My parents and dancers just raved about the facility, the staff and the wonderful intention of your competition. I am so proud of you and all you’ve brought to the competition industry and so proud to call you my friend. It was such a great beginning to the season especially since this group is so new and for the majority of my girls this was their FIRST ever competitive experience. I am so glad it was at Tribute!! Can’t wait to come back next year! Thank you so much for an amazing competition Saturday in Milford, we truly enjoyed it, I found it to be the best one we have attended so far, I truly appreciated how friendly and down to earth, and fun the entire staff was ! The backstage crew were so fun laughing with the dancers , dancing with them , etc ! I also appreciated how affordable it was , I have 4 daughters competing which as we know gets expensive really quick , and was thrilled to be able to let them each get a souvenir as well as a plaque for their bedroom walls! I know Robyn Wilson and her family well and was thrilled for them winning the essay contest! I also loved how family orientated it was with Olivia and Jonah passing out awards ! I definitely hope Robert Lee comes back next year! I was also appreciative of my daughters sending in tribute to their parents and you printing it up for them even though it was supposed to be for the dancers and teachers I was shocked and proud by their words! All of the parents really enjoyed this competition also !!! THANK YOU!!!!! Would just like to take a moment to say Thank you for making the Detroit competition this past weekend so wonderful. We had a great time, and everything was so smooth and hassle free. :-). I just wanted to congratulate you on a great first competition! My daughter is a senior on the Xtreme Dance Team, and we have had the opportunity to participate in numerous competitions over the last 7 years. Quite honestly, I was expecting there to be some kinks with Tribute considering that this was your first event. You and your staff definitely proved me wrong on that – everything ran so seamlessly, and I was more than impressed on how professional and organized your staff was. You did a great job in selecting your team! Tessa, Kathy and Jessalynn have always had nothing but great things to say about you – I am confident that Tribute is going to be huge success! I also wanted to commend you for the “Tribute to My Parents” essay contest. That was such a powerful and emotional segment for me- thanks for recognizing the devotion that parents put into dance behind the scenes. It is a lot of work, and it is expensive, but it’s all worth it to see these kids doing what they love. I know that no matter what is going on in my world, when I am watching my daughter dancing on that stage…I am happy. My daughter’s father passed away almost 9 years ago – before she had ever set foot in a dance studio. But just like your dad, I know that he is looking down on her now, and I know that he is proud. Best wishes for the rest of your season! I wanted to let you know just how much I loved attending your new competition in Kansas City. I had no doubts that your competition would be a successful one. You have always had such an amazing talent for what you do. You run a crazy weekend of thousands of dances with such class, organization and eagerness to both please and push dancers to become their best. Of course, after attending your new competition we encountered nothing less than your best. Your staff was amazing, the feedback from the judges was exceptional, and your always personable nature is always so refreshing. But for me, that weekend was so much more than that. After having my 2nd baby in less than 2 years in September, everyday that I went back to the dance studio after my maternity leave I wondered if I was going to be able to make it work. I was feeling like teaching competitive dance and having a growing family was just too much of a conflict. I didn’t want to make anyone feel short changed. I felt like I needed to compartmentalize the two parts of my life as I wasn’t sure that making my family a part of my business would be acceptable. As far as my students go, I had always told them that family comes first. I have never batted an eye when they miss class or rehearsal for family events. For some reason I could not let myself have that same consideration. Watching you live out your dream with your family by your side was the ah ha moment that I needed. Here you are having to give everything you have to pursue your dream and there was your wife and kids enjoying every minute of it with you. I don’t feel like any moment of that competition was compromised by you making it a “family first” event. My own children were able to attend moments of the competition and I felt proud knowing that they were able to see what all of my hard work was going towards. I know that you must feel that same way. So thank you so much for creating something that had so much more than just a positive effect on me for just one weekend. I can only imagine the amount of work you have had to put in to complete your dream and I want you to know that, at least for me anyway, it was well worth it! I am writing as a proud grandmother of three. I have been attending competitions for many years with hopes that I offer some help to them and to my daughter, their mother. Usually, it is with expenses, sometimes with perseverance, and always with love and encouragement. My rewards are the joy of seeing them performing and doing that which they love and knowing that the art and “sport” of dance is keeping them fit and healthy in mind, body and spirit. I do not need to tell you that dance is a “way of life” for many families…..a lot of commitment and sacrifice. So……..when I learned that we do not need to buy programs (usually two for us; one for the dressing room and one for me in the audience), I was soooo pleasantly surprised and I am genuinely grateful. What a great gesture from you and your organization! I wish you the best of luck in your new endeavor. Your kindness is a good indication of future success. Hi Darin -People that know me know that I don’t communicate with friends and family as often as I should. But, this weekend’s Tribute National Talent Competition in Davenport, IA, moved me to write this email to tell you what a great job you are doing with your dance competitions. As you know, you created a very special moment for our family last year when you honored us with the “Tribute to My Parents” recognition based on essays submitted by our daughters, Anna and Abbey. Well, this year’s presentation in Davenport brought a tear to my eye and a well deserved standing ovation from the capacity crowd at the Adler Theater. You’re doing God’s work by using the forum of your national talent competition to elevate and celebrate the importance of family and I thank you on behalf of all dance families that work hard to keep our children dancing. Please keep up the good work and stay in touch if I can ever be of assistance. I think the world of the job you are doing and I’d be honored to be associated with you as you grow your business. Such an amazing weekend! You have a wonderful family. It was so nice to be able to meet them and share such wonderful memories together. Thank you so much for making a dance competition so much more than what it has ever been for so many. It was so meaningful to me. Thank you so very much! We had a great time this weekend and enjoyed the format and emphasis on family of Tribute. Can’t say I’ve ever cried during an awards ceremony, but the Tribute to my parents did just that. We will see you next year and have already spread the word to other studio owners and parents. Best Wishes on the rest of your year. Thank you! Thank you for an amazing competition. It was great seeing your beautiful family! Thank you Darin for a wonderful Weekend!!! Great staff and a first class organization!!! Your family was the cherry on the sundae.. Beautiful family and what a wonderful place to be for my daughters last dance regional!!! My husband, daughter and I want the thank you for such a memorable weekend. Memories were created this weekend that will last a lifetime and we thank you that you present that opportunity through your love and dedication to family and your loving Father. We were overwhelmed how you glorified God through your presentation of the “Tribute” award. Your Father is very proud of you!! And we are very proud of Samantha and so blessed that she got to take part in such a wonderful weekend. We look forward to attending your competition next year. We pray for continued success and many blessings for you and your family, always! Darin- THANK YOU for an AMAZING dance competition. I have been to many over the years & I must say that Tribute was the best one I have ever attended!! Your family & staff are wonderful!! Your an amazing man & respect you so much for what you did on stage today!! I can’t wait to come back next dance season!! Thanks Darin for the great idea of the free online program book. Saves me a big step before our studio even hits the road. Looking forward to seeing you again and a Great Weekend. Excellent competition! Thank you for such a wonderful experience. My daughter was in the Honor Level at BB Dance Productions (Diddle Diddle Swing and Fabulous) and was so thrilled to receive 1st place. She recently turned 6 and this was her second (and final) competition of the season. Also, what a lovely family you have. It was great that you included them, especially your children, in the whole process. As I stated previously, I wish you much success in the future. Thanks for a great competition. We loved it. You gave it heart. Thanks for an awesome event this weekend! Hope to see you next season.. It was so great seeing you this weekend! Thank you for putting together such an amazing competition for the dancers. My babies had so much fun! It was so wonderful to meet you and take part in your competition this weekend. My daughter Taylor had a great time and I for one loved that the message was about giving back. I truly believe that if we taught children early in life that they have everything they need inside them to help others, the world would be different. So thank you for making such a wonderful competition that made us feel less about it being a money machine and more about sharing a talent. Just wanted to thank you for a wonderful weekend! We truly enjoyed Tribute and all the dancer teachers, and dancers who attended! I wanted to thank you for a wonderful weekend for our dancers at The Dance Warehouse. Many of our parents and students commented on the positive nature that the competition had. You and your staff have created a fun environment for the dancers to not only compete but to perform as well. I am so happy that you have found your way to something that you enjoy and makes you so happy. It is so evident to anyone who walks through the doors of your competition that this is truly what you love to do! I was so sorry to hear about the loss of your dad. You have found such a wonderful way to honor him and his memory. Our family has also been finding ways that we can remember and honor my brother and it has been a wonderful way for us to come together and become closer. Sometimes our greatest tragedies bring us to our greatest dreams and now we have an angel over our shoulder to help guide us along the way. Thanks again for a great weekend….it was so great to see you! Darin…..Thanks for an awesome weekend in Minneapolis. It was just as we had expected. See you next year. Thank you for a class act event. Heart felt, gracious and fun. The entire staff was outstanding. Oh my gosh…the Tribute to My Parent award had us all in tears and the audience as well as the judges gave the dancer and her parent a standing ovation…which was SO deserved! What a great way to give the kids an opportunity to remember to appreciate their parents and put life back in perspective. Can’t believe that Darin Troglia refunds that dancer their ENTIRE entry fees for the weekend and then goes above and beyond and he donated to the American Cancer Society since this child’s father was diagnosed with cancer earlier this year. This is awesome Darin what you have created. Alexa has been dancing since she was 3 for Miss Lore, and we first met you on a mothers day weekend. My mom would drive down to watch and she is no longer with us due to throat cancer 8 yrs ago. So when you read that essay it really hit home for us and if it was not for her grandma (my mom) Alexa would have never been where she is today. God bless you Darin it was a wonderful day! It was amazing to witness! You are changing the dance world one weekend at a time! Your tribute to my parents scholarship is such a wonderful thing! You are an amazing person Darin!!! I just want to thank you again for the extremely generous gift you gave our family! I can’t express enough what a blessing that is to us! What a wonderful thing you are doing in your father’s honor and I’m sure he is extremely proud as he watches over you as is your mother as she shares this experience with you. Hope Tulsa went well and you are loving the first season of Tribute! All our parents were very touched by your generosity and felt that Tribute was an incredibly welcoming competition where they truly felt like the entire staff appreciated them being there. So kudos to you and all your staff. There are not words to express how proud of you I am. You have taken your outstanding reputation and integrity and turned it into a successful business over night. First class all the way! Thank you for allowing me to be part of it. We had a fabulous time. It’s always great to see you. I cannot say enough positive things about the staff. OUTSTANDING! I am so very happy for you. You better be careful because this company is going to explode and be so successful! You have everything in place for that to happen! We enjoyed the Tulsa competition very much and plan to make it a yearly venue. Everything went very smoothly and it was truly a wonderful weekend. Thank you so much for having me judge this past weekend in Tulsa. It was truly inspirational! Also thank you for all you have done to make it so successful. Thank you so much for a great Tulsa competition!! The dancers from Rhythm Alley had a wonderful weekend!! It was so fun to be a part of it!!! Totally impressed by your competition this weekend in KC! 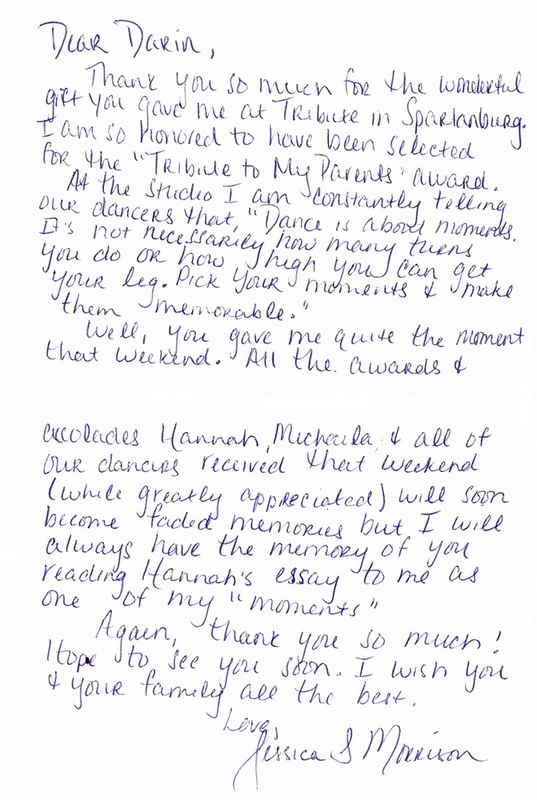 Loved what you did with the Tribute to Family and what you did for Access Dance. You all are a class act and not only encouraging dance excellence but also helping to instill life lessons! Glad our studio was a part of it all in your inaugural year! We wish you all the best and hope you’ll continue what you’ve started for years to come! What an amazing weekend in Kansas City!! Thank you! We had a blast at Tribute!!! Great Competition!! Congrats on the new venture/chapter of your life. You are doing the right thing.. I just wanted to say thank you. I truly enjoyed my weekend at Tribute and more than anything I am so happy for you. My favorite part of the weekend was the Tribute award to Lance and Kathleen Schaefer. I know the both of them very well and from personal experience and you couldn’t have honored a better family. They are absolutely amazing. They have put all three girls through not only Centerstage, but have also put them through my studio, S&R. I wish you continued success for Tribute. It was so well run and honestly the entire weekend I was just thrilled for YOU.. I hope someday I can support you by bringing my studio to Tribute. As you know it’s all about dates and schedules but you have never been anything but kind to not only myself but my “kids”. Congratulations and hope to see you again soon! Just wanted to say thank you for a wonderful weekend in Chicago. The competition was exciting and our dancers did a fantastic job! We are so proud. All of our girls are our family, and we support and love each and every one of them. 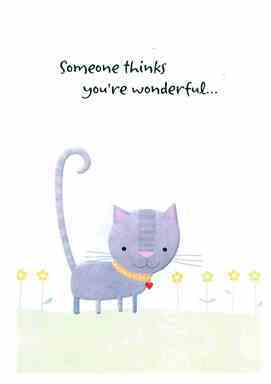 You are an exceptional person and I feel honored just getting to know you, even though it’s thru email and phone conversations. I can’t wait till next year! What fun! We really enjoyed your competition! The staff was very kind and accommodating and the facility was lovely. Thank you and good luck going forward! We can’t wait for next year!